On December 28th 2017, a demonstration was held in Mashhad, which was the beginning of a series of days that shook Iran. Mashhad is a major city in northeastern Iran, which is considered one of the most important religious sites in the country due to the presence of Imam-Reza’s tomb, the eighth Imam of Shia Islam. In addition, the Shrine Office apparatus and its financial empire, known as Astan-e Qods-e Razavi, including a large number of factories, land lots, gardens, shopping centers, and commercial and financial institutions. These entities have led to the concentration of an important and influential part of Iran’s political elite in the region. At first, the spontaneity of the demonstrations and the high pitched slogans against the reformist government of Hassan Rouhani led many reformists and pro-government journalists to blame the other for growing discontent. Some journalists attributed the demonstrations to discontent with the conservatives and military institutions behind the scenes, especially to Rouhani’s rival in the presidential election in May 2017, Ebrahim Raisi, who is born in Mashhad and is the chairman of Astan-e Qods-e Razavi. Reformists claimed the demonstrations were aimed at the fundamentalist and conservative opponents of Rouhani’s government. But such claims were increasingly negated as rallies spread to nearly 80 cities and intensified against numerous state entities. The rapid spread of these protests was attributed to rising prices that soared in just less than 48 hours. Unlike prior political protests in the preceding two decades which often started in the major cities, these protests spread rapidly across smaller cities and poorer neighborhoods who were suffering the most from marginalization. Actions spread beyond street protests and chants against rising prices. Government offices, banks, and financial, and credit institutions affiliated with the state’s military and intelligence apparatus were also attacked. In some cities, attempts were made at occupying offices of the governor, department of justice, and the state appointed highest ranking cleric of the city (Friday Prayers’ Imam). The first reports of the state’s murder of protesters further radicalized the demonstrations. The small town of Izeh in southwestern Iran was liberated for several hours until the government sent troops from the neighboring cities to Izeh, in order to reoccupy the town. In the end, after imposition of martial law in many cities and towns and some bloody clashes, the uprising was suppressed around the 6th and 7th of January 2018. Where did the uprising come from? After the war between Iran and Iraq ended in 1988, the Islamic Republic imposed an array of neoliberal policies. These efforts were aligned with recommendations from the World Trade Organization, the International Monetary Fund, and the World Bank to ensure Iran’s place in the global market. Ali Akbar Hashemi Rafsanjani, Mohammad Khatami, Mahmoud Ahmadinejad and Hassan Rouhani – despite appearing as opposing political factions – were each critical in the successful neoliberalization of Iran’s economy. Policies included gradual privatization of public assets, labor law reform for the benefit of the managers, and cuts to social security. Strikes and protests were brutally repressed across Mashhad, Qazvin, Zanjan and Islamshahr during Hashemi Rafsanjani’s government. The bloody crackdown on Khatun Abad copper mine workers in Kerman province and the mass arrests of labor activists who wanted the recognition of their right to form independent organizations during Mohammad Khatami’s administration were also significant. Many workers also suffered heavy prison sentences for participating in a handful of independent labor organizations during Ahmadinejad’s administration. After gaining power in 2013, Rouhani’s government was obliged to continue the implementation of these economic policies, first undertaken by Mahmoud Ahmadinejad. Given the historical and class-related tasks of Hassan Rouhani’s government, his administration contained a combination of neoliberal economists and statesmen with security or intelligence backgrounds. It shouldn’t be forgotten that Hassan Rouhani himself has been in Iran’s most important security centers for many years; including the war and arms deals, which led to the Iran-Contra scandal, as well as the Office of Strategic Research of the Presidency and the Expediency Council, which are responsible for codification of a part of the Islamic Republic’s security policies. These are the institutions where he met some of those who later had to be involved in his government as advisers and ministers; including Hesamodin Ashna, the president’s adviser who was the Deputy Minister of Intelligence, and Ali Rabiei, the ex-minister of labor for the government of Rouhani, who was an interrogator in the Ministry of Intelligence previously. Meanwhile, Hassan Rouhani was in charge of restoring the international image of Iran and reaching agreements that became known as “JCPOA”. Although the mainstream media focused on how under JCPOA sanctions against Iran will go away step by step and Iran will stop its nuclear program, but the unspoken side of the JCPOA was the preparation of the conditions for western investors to enter the country. For this reason Rouhani’s government has advanced negotiations with the West and further nulling labor protections for the working class in order to lure Western investors with a cheap and submissive working class. Although the amendment was confronted with social resistance, and was no longer on the agenda of the 2017 presidential election, some of its most important provisions became administrative directives and were finally executed. But these neoliberal policies simultaneously caused a surge in protests among the poor. The wave of strikes began in factories and industrial towns and led to campaigns in a number of industrial centers like the Hepco Arak Factory, Haft Tappeh Agro-industrial Sugarcane Company, and Azarab Industries Company. Teachers guild associations, which were formed during Khatami’s second term and organized numerous strikes and protest rallies, came to the streets and were more radicalized, and campaigned against the privatization of education and the degradation of teachers’ rights. Pensioners, whose devalued social security was one of the targets of the government’s neoliberal policies, rallied many times in front of the state-run institutions and slowly formed organizing bodies. such as the “Pensioners Union.” In the vacuum caused by depoliticization of the universities, which was the result of Rouhani’s populist and security-oriented policies, the Student Guild Associations became the forefronts of the resistance against government’s privatization policies towards higher education. Workers’ organizations, such as Drivers’ Syndicate of Tehran and Suburbs Bus Company, the Haft Tappeh Workers’ Syndicate, the Free Workers’ Union, and the Coordination Committee for Assisting the Establishment of Workers’ Associations were formed a few years ago and previously exhausted due to the suppression of the Ahmadinejad era, were re-activated under these new conditions. In addition, there were the duped deposit holders, who lost their marginal savings, which were deposited in finance and credit institutions that were directly or indirectly related to the military bodies or individuals with ties to them. After successive declarations of bankruptcy by those institutions, these people lost all of their savings, and started protesting and rallying as well. The class content of these protests and fights created organic connections between different engaged forces in the fights in a natural process, which sometimes grew into the form of provisional temporary cooperation. For example, during the formation of the “Campaign against Internship” –which was formed to protest the government’s draft law- various forces from student guild councils to labor, pensioners and teachers organizations also collaborated. The internship plan was a plan approved by Rouhani’s government only a few days after his re-election. According to the plan, students who graduated would be introduced to industrial centers and factories as a free or very cheap workforce without insurance and employment contracts for a while. In the course of the December Uprising, what seemed to be ended forever was a discourse that was always sought to open a path through the conflicts and differences of the various factions of the state and for almost two decades, it has become a hegemonic discourse that the only way to improve the situation is not to radically change anything or everything but to strengthen the moderate faction against the extreme right wing of the government. However, such a statement kept silent about the point, that what was called “the Moderates” had been changing in its nature. During Mohammad Khatami’s presidency, his reformist proponents had a position against Ali Akbar Hashemi Rafsanjani and forces close to him, including Hassan Rouhani and criticized Rafsanjani’s cultural and political policies during his presidency. Later, not only Hashemi Rafsanjani had become their liberation legend, but also Hassan Rouhani turned out to be the most acceptable reformist choice for presidency. The same people, who before the election of May 23rd, 1997 propagated that in case of Ali Akbar Nategh Nouri’s victory against Mohammad Khatami, based on his intensifying of the gender segregation policy on the streets would lead the country to a dark era, are now with Nategh Nouri on a common front. In order to exclude some of the prominent conservative figures during the last parliamentary election campaigns, they included a number of other conservatives on the electoral list for the Assembly of Experts, including one of the most famous judges during the mass executions of political prisoners in the summer of 1988, and another one, who was in charge of the Ministry of Intelligence at a time when this ministry killed a number of writers and figures opposing the Islamic Republic in the fall of 1997. This discoursal hegemony in the last two decades ridiculed poorer strata of society from small towns, poor neighborhoods, rural villages or slums. The belief was that those areas would be the conservative and the reactionary strongholds and therefore, the bourgeois middle class would be the only real force of change, particularly the upper classes in the major urban centers. Those who believed in these stereotypes were only a part of Iranian society, who were loyal to the requirements of what was called modern life, such as rule of law, individual freedoms, lifestyle movements and also, more than others, were fascinated by Western civilization; citizens whom reformists have been able to represent politically through the elimination of other forces. This discourse had always referred to the electoral politics as the only possible way of politics. Based on the number of votes for the reformists in the major cities and the small towns or villages, where they lacked votes, villagers, people in the poorer neighborhoods and slums were further marginalized. However, if some conservatives in these areas were attracting public opinion, it was because the reformists obviously neglected them. In contrast, parts of the conservatives, such as Mahmoud Ahmadinejad’s faction and his supporters –while having little differences in economic policies with their reformist counterparts – were in their own words linked with the lower classes against the aristocracy of the reformists. During the December Uprising, another rupture represented the myth about the liberatory potential of the bourgeois middle class. While the voting enthusiasts, living in the large cities, were silently watching the growing misery of the dispossessed, those who were denied having the eligibility to intervene in politics, suddenly changed the whole political image of Iran. By shouting the slogan “Reformist, Conservative, enough with your narrative”, they announced the beginning of a new chapter in Iranian politics; a chapter, in which politics was not the stage between the two factions of the same state and status, but a struggle for those who wanted to interfere directly in their own destiny, against the totality of the state and all of its internal shears. So from the beginning of the uprising, the reformists and organic middle Class intellectuals opposed it in different formulations. Some of their prominent faces such as Hamidreza Jalaeipour (Editor in chief of one of the most important Pro-Khatami Newspapers – Ex-Governor of Mahaabad) and Abbas Abdi (One of the Student Followers of Imam’s Line – a close adviser to Khatami) referred to the protesters as “vultures” and demanded the security and Police forces to crackdown of the “riots”. Reformist supporters in virtual networks and in interviews with mainstream media called the “riots” suspicious and attributed it to a diverse range, from Revolutionary Guard Corps, Friday prayer Imams opposing Rouhani, to Saudi Arabia and the United States. The president and government officials said they should take a decisive approach with the insurgents and end the Rebellion as soon as possible. In such conditions, nearly 40 people who participated in the December uprising were killed. More than 10 detainees were killed in prison under unclear circumstances, and others were killed on the streets as a result of direct shots. 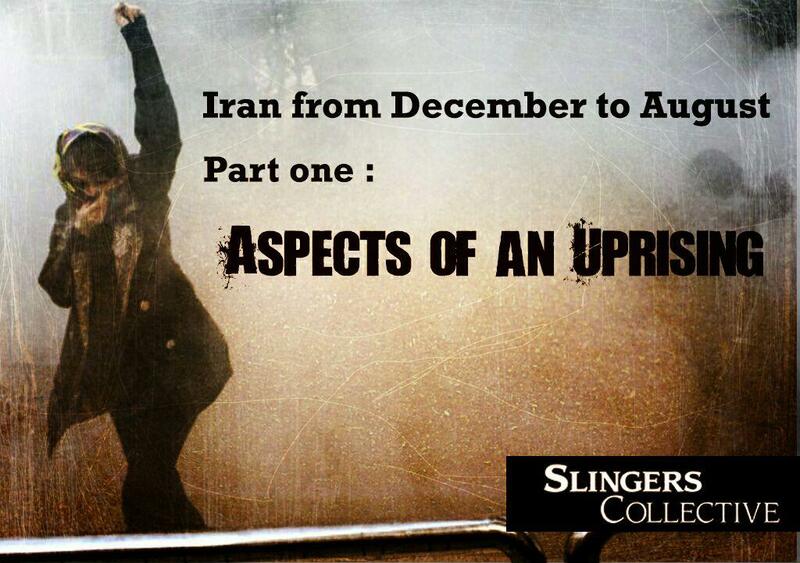 According to news reports, more than 5,000 people were arrested during the December uprising across Iran. The uncertainty of these reports, caused by words such as “nearly” or “more than”, are due to the fact that access to accurate news sources has been difficult and inadequate. This has been stymied further with a major crackdown by the state against journalists and since much of the coverage was about the poorest strata of society who formed a major body of the December uprising. For example, one of the few released reports on prison sentences mentions that for eight people in the small town of Tonekabon, located in northern Iran and at the margin of the Caspian Sea –including three vendors, two construction workers, a hairdresser, a shoemaker and an unemployed person- various imprisonment sentences have been issued. Although these people have had the chance to inform human rights activists about their sentences, most of the detainees and the families of those killed, have been denied access to such information. Nevertheless, the count of the murdered protesters during the uprising shows the fact, that the Iranian regime will encounter uprising of the Dispossessed much harder, especially when its hegemonic agenda is to overthrow the current order. While in the course of the called “Green Movement”, which began to protest the June 2009 election results and lasted for nearly two years, just over 100 people were killed; during an uprising that did not even last 10 days, close to forty people were killed. The second part of this analysis will be published in a few days time, allowing the reader to follow its contents without having to read through a lengthy article. Subtitled, „Say hello to the End!“, it will delve into the second wave of protests that took place in August and will explain how the different movements and sections of the December uprisings have resurrected and continue their work after the first wave of protests was smashed.